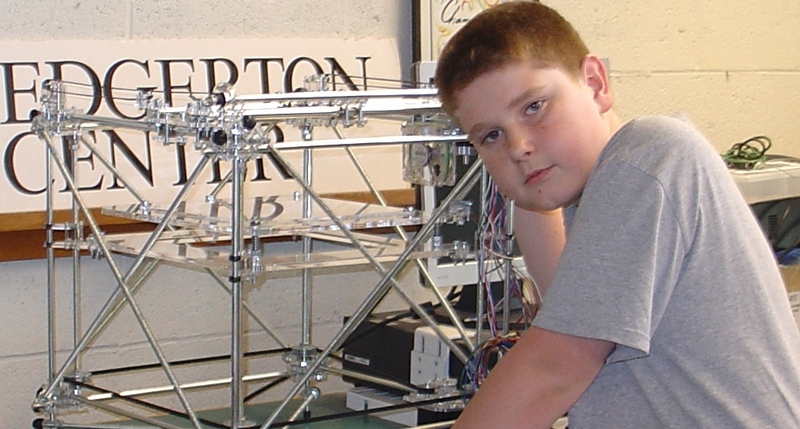 This is probably the reason why David Baker, a 13-year-old patent holder and inventor, is building a RepRap. It is an affordable but still very powerful start of being able to seriously design, prototype and engineer other things! Because of its open design, if you run into a constraint that the RepRap has, you will be able to modify any aspect of the machine. People trying different things that push the envelope will generate very important input for the main RepRap project. David Baker (13) in front of his Rep(st)Rap. Personally, I feel it is very important to give kids with talent the tools to explore what they like to do and learn what they’re capable of. Apart from making or fixing useful stuff, I know several artists that have been making very interesting things with it. Often they push the envelope by wanting something different with the machine than is conventional. This brings about various interesting concepts that might end up in variations of the RepRap. Also engineers are using it to try to make circuit boards, 2D or even in 3D! This will open up a whole range of new design methods and toolchains.